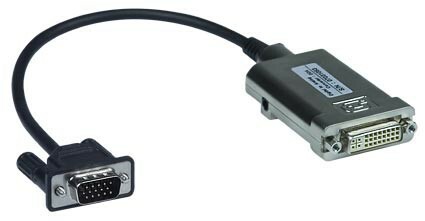 Connects computers with DVI-D connectors to analog VGA monitors or projectors. Supports up to 1920x1200 (WUXGA) video resolution. One female DVI-D dual link input connector. One male 15-pin HD output connector. WxDxH: 1.5x3x0.6 in (38x76x15 mm) with 10" (254 mm) attached VGA cable. Includes 6-foot (1.8-meter) DVI-D single link male to male cable. Includes VGA female to female gender changer. "The DVI-VGA is working out very, very well. The pastor has his iPad connected to something called an Airport. That Airport device is streaming video to his Apple TV. We are then using the DVI-VGA unit to convert the DVI output from the Apple TV to VGA so he can show his display to the rest of the congregation. Very clean video even with the conversion!" "I looked everywhere for a DVI to VGA converter and finally found it at Network Technologies. This device has allowed me to continue my normal work process at a greater reduced price. The alternative solution would have cost more time and been less efficient. NTI has the products others don't and they give you a guarantee to make sure it works for you. I would definitely recommend NTI to others."